Source: Given to me by author for review. I was contacted by Kimberly Montague the author of Altered back in the beginning of June and she asked me to read and review her book for my honest opinion. Altered is a Young Adult novel that is a great read for any age. After reading a short summary of Altered that was sent to me by Kimberly, I knew I would really enjoy having the chance to read her book. Kimberly live close to me in North Carolina, which is really neat. So here is my review of her book. Thank you so much, Kimberly for your book and a chance to review it for you. Deep in the Sierra Nevada mountains there lies a cave that has been the source of local legends for centuries. Purported to be the home of an ancient deranged and vicious animal, many have gone in seek of it, but what lies within is far more dangerous than a mere creature. 17 year-old Piper “Evie” Kenley’s life has been anything but calm, however, the turmoil of losing almost her entire family is nothing compared to the difficulties she is about to face. Robbed of all other alternatives, she moves in with her boyfriend of seven years and his family only to find that she has an intensely electric connection with the handsome and popular Devlin Vaughn- Captain of the football team. Try as she might, she cannot avoid this connection they share leaving her with a choice to make. But just as she begins to feel her life is in order, one camping trip and a testosterone-driven dare involving a cave with a deadly and contagious secret will send her entire world into complete chaos. 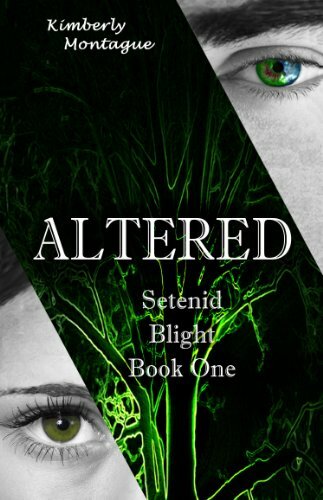 I am very impressed by Kimberly Montague's first book in the Setenid Blight series, Altered. The plot of the book is a very fun read full of Romance, suspense, and difficult choices. A classic love story with a twist. Altered starts out with the reader's learning about a few of the main characters, Evie, her brother Harm and Evie's boyfriend of seven years, Jay. Evie and her brother Harm recently lost there Mother and Father and are dealing with being alone and having to take care of each other. When Harm decides he wants to join the special forces, he leaves Evie in Jay hands where they end up going back to a town they once lived in before. Evie is to live with her boyfriend's family for the time being and start school once she is settled in. On the first day back to school with Jay by her side she ends up meeting a guy that she feels a intensely electric connection with, Delvin. He is handsome, popular and Evie feels drawn to Devlin even before she meets him. With more and more encounters with Devlin, Evie is starting to fall in love with him even know she knows in her heart she is with Jay... Evie finds herself falling more and more for Devlin and less attracted to Jay. When her decisions lead to more that what she bargained for, Evie and Devlin now have there love put to the test. Something weird is going around and people including Jay are not acting like themselves, but rather something very evil. Evie and Devlin along with there friends now will fight there way to find safety and stay together in a town that has gone mad, but why? I loved the style of writing that Kimberly Montague uses. It was a beautifully written book with wonderful descriptions of the people and events that take place during the book. I really enjoyed the heartfelt romance in Altered. A True love story with a twist in the end. I kept wanting for everything to be okay in the end but was left with a cliff hanger. Altered will never leave the reader disappointed It is fast and fun read with plenty of mystery and romance. The only reason I ended up giving it 3.5 stars and not more is because I felt during the middle of the book was all about the romance between Evie and Devlin and I wanted more of the mystery of what was going on in the town. In the beginning of Alter you learn about these weird things happening but the book does not go into it until much later. Other than this I really enjoyed reading Altered and would recommend the book to anyone over the age of 15. I'm wondering what Inverness is. Hope you can come Beckie.